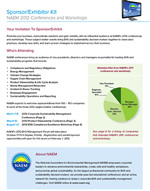 Generate new business opportunities and gain visibility with an influential audience of EHS and sustainability decision-makers. As a conference sponsor, you receive access to a conference with dynamic programming, an exhibition space in the Resource Center and contact with senior managers. This is your opportunity to meet a targeted audience, showcase your business solutions and develop valuable industry leads. 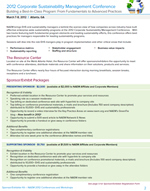 For further details, contact Brent Hendrix, Manager of Marketing and Sales, at brent@naem.org.